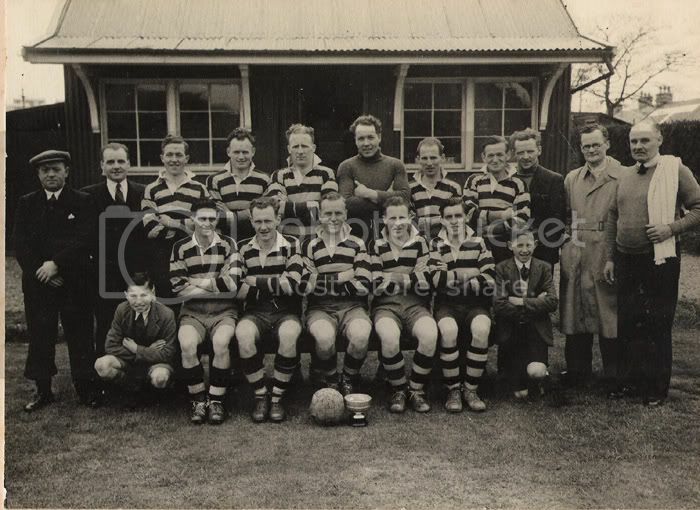 This is a photo which I found amongst some of my Grandfather's stuff from 1946-47 showing the junior team Glenside AFC. Wondering if anyone can help with names in the photos. Davy, not absolutely certain but I believe the last player with the strip on the right in the back row could be Neil Gillies, father of Donnie Gillies. Here is my opinion on some of the people pictured in the old Glenside photo. Wide left (man in the flat cap) Jock Lipton. Next immediate right of AH - back row - George Cook. Next immediate right of HMcG - back row - Adam Graham - young Adam's granda. Next immediate right of AG - back row - Neilly Gillies - Donnie Gillies the painters dad. Next immediate right of NG - back row - Hughie McArthur - committee. Front Row next to uncle John - Duncan McPhee - the dad of Jim McPhee, Burnbank Garage. Coming in from the right next to DMcPh - Hector Graham - brother of Adam Graham in back row. Thats all at the moment. Last edited by Mack on Fri Mar 05, 2010 10:35 am, edited 3 times in total. The man beside the young lad on the front wide left could be Pat McMillan? Pat was the Glenside right-winger. Where is it taken? the background buildings dont seem like those at Kintyre Park. Although, back then there could have been a row where the garages are now. Mack - Thanks for the information, you reall do have an amazing knowledge of football! Been meaning to speak to the auld man, I think he knows more. I think Jock Lipton may be relation of mine, quite sure there are Liptons in our family tree. Interestingly enough I have the year book for the 1947-48 Junior Football Season and here is the list of players then, I'm sure many would have played the year before and are in this photo. 4th gen Suthen' wrote: That's a good one. 4th Gen, I just assumed it was Kintyre Park too until I looked closer. Definitely not and now recall my Dad saying it was an away tie in the Scottish Cup somewhere. Will find out. Something in my memory bank tells me it is Athurlie Juniors Park in Barrhead. I think I must have had conversation with someone about it - especially the small, rather ornate pavilion behind the team. The only thing that put me off was the Orr-Ewing Cup being displayed. However; the 'Glen' was a very proud team - like all the junior sides in Campbeltown at that time - so I have to say that they must have brought their cup with them for the photograph. I'll settle for Arthurlie Juniors, Barrhead. I'll need to look up the actual name of the ground. Is the Orr Ewing cup "found" Mack? hope so. Yes, the Orr-Ewing Cup has been found - and is the safe keeping of a former football player. He has offered to return it to the community when we can find a place to display the historic cup collection. I have the Charity Cup (1887), the Sutherland Cup (1923) and the McCallum Cup (1946) in safe storage. All the cups are the property of the Campbeltown & District Junior Association (now defunct). I have been in conversation with the people responsible for the Museum to try and get a special place/cabinet for their display. With the photographs I have from past history, I would say it would be of great interest to the community and beyond. I have also been in touch with a specialist to see if he can repair and restore the said trophies. The cups deserve to be on display as they belong to the community. Mack wrote: Yes, the Orr-Ewing Cup has been found - and is the safe keeping of a former football player. He has offered to return it to the community when we can find a place to display the historic cup collection. It is funny you should say this as I've been looking at stuff of my grandfather's (like the year book for 1947) and been thinking it would be great to have these kind of things on display (of course I would have to ask the family). I'd be more than happy to help with some stuff I have and I am sure through local contacts and the forum there is some more facinating stuff out there. I wonder if anyone has an old ball and strip of any of the eras for example? A couple of us were also chatting about the possibility of getting history of sport in Kintyre displayed in Campbeltown somewhere - there is a huge amount of success that we should be proud of and I'll post a separate thread on this. Personally, I'm facinated about sport in days gone by. Your idea of displaying cups etc is an excellent idea - well done in following this up. Just been looking at this photo and wondered if any one can verify if the lad on the far left is one of the Duncan boys? Either Bobby? or William Duncan? Certainly looks like one of them. Mzz pasico wrote: Just been looking at this photo and wondered if any one can verify if the lad on the far left is one of the Duncan boys? Either Bobby? or William Duncan? Certainly looks like one of them. Do you mean the young chap first left in the front row, Mzz Pasico? If so his surname is Robertson, can't recall his first name but will find out. Hi Ship, just thought the young fella far left just to the right of Mr Lipton resembled one of the Duncan Boys but I'm probably wrong. Can anyone tell me if there is any photos etc in existence of my Great Uncle John Durnin? I am collating a history of his football playing years. I have traced most of his career after he left Campbeltown but know nothing of when and where he played before leaving and if he ever played once he returned. He was a fisherman in Campbeltown in later years.